An enjoyable read—it has elements that reminded me of both “The Martian” (which I loved) and of investigation novels in general—, although I found myself able to predict the twists (the deal comes to mind, but it’s not the only one), so the mystery part wasn’t 100% a mystery for me. I enjoyed the preparation parts: how Frank gets “recruited”; his training; meeting the other convicts/astronauts (as well as the crushing realisation that he wasn’t going to be “a real astronaut”, just a prisoner sent to Mars and not necessarily considered as a human being). I tend to enjoy the hard science/technical details in such novels, so I was glad that some was included here, and that it made sense. Then there’s the Mars ordeal itself, of course, with this little group of ragtags and misfits having to face unexpected shortages and various problems before their base can even start being built. I expected a story where things go wrong, where the planet itself will kill you at the first opportunity, and I wasn’t disappointed in that regard. Also, the XO company had been cutting corners, and it shows; and it makes more sense, in a twisted way, the further you keep reading. The main character, Frank, was likeable enough. He’s a murdered, but he “only” killed once, to save his son, and his reasons were more born from despair than from any twisted desire to kill for the sake of killing. At times, I found him perhaps a little “passive”, in that I thought he’d get to wonder about the deaths of his fellow inmates sooner than he did; on the other hand, he’s an older man who’s spent several years in jail and learnt to keep out of trouble there, so it also made sense that he’d want to keep out of trouble on Mars, too, by putting on blindfolds and focusing on his building and maintenance jobs. I believe his lack of curiosity was more an instinct of self-preservation, an ingrained desire to keep his head low in order to survive, rather than get interested in things that could put him in danger much sooner. I was less satisfied by the rest of the cast, though, mostly because we don’t get to know them very well. They were defined more by what had sent them to jail (the cyber criminal, the ex-Neo Nazi, the doctor who euthanised her patients, etc. ), than by what made them as human beings. As a result, I didn’t feel invested in them, and when they started dropping, I founder myself not really caring; they were plot devices, rather than characters. I don’t approve of padding a novel just to sell more paper, but in this case, I’d have gladly taken some 100 extra pages to get to know the whole crew better. Conclusion: 3/3.5 stars. 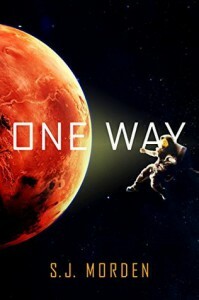 Not a novel I loved, but I still enjoyed it, and would still recommend it to readers who don’t mind a bit of jargon, and are interested in the struggle on Mars as well as in the murder mystery aspect.